Today is the first day of my very favorite season, so Happy Fall to all my readers out there! The days are getting shorter, the nights are getting colder, and it is time to haul out those cozy crocheted, knitted and quilted blankets for some serious cuddling. Of course, this time of year also means I'm back in school. This semester I am only taking two courses, my last two prerequisites before submitting my application to the nursing program in January. I am also starting work at a part time job this week, so there will be even less time than ever for me to pop in here and update you on my handiwork! Of course that does not mean handiwork won't be happening! 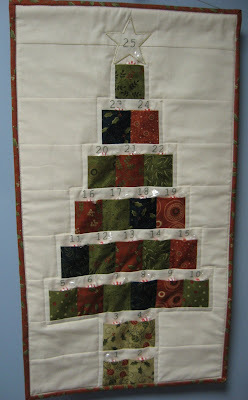 On the contrary, my hands will still be busy stitching when I can, but posting about it will just have to wait. Thick and cozy, just perfect for the cool weather of fall and the cold of winter that is right around the corner! I'd say Jan has every right to be proud of this lovely crocheted afghan. Thanks so much, Jan, for sharing your work with me and hopefully inspiring others to give it a try too! I finished Mary's wedding gift afghan, but have not yet mailed it. I still need to take some pictures of the finished afghan, and find a box to mail it! I am also working on another crochet project which is coming along very nicely. Pictures will have to wait though because it is a surprise for someone special who just might read this blog! 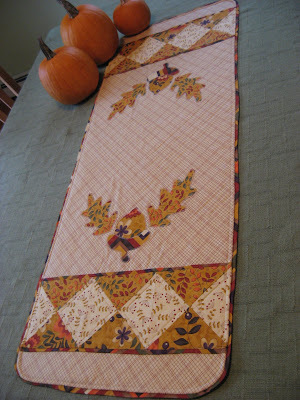 And I have been doing a little sewing in my spare time too, getting my Impromptu quilt backing pieced, and also piecing a quilt of Deb Strain's Saltbox Harvest that I bought in a kit a few years ago. So I have two quilts ready for the long arm now. Also using the leftovers of the Saltbox Harvest yardage and a jelly roll that I purchased at the same time as the kit, I am making this fun tote bag pattern from the Moda Bake Shop. It will appear in my Etsy shop when it is finished, hopefully within the next week or so since it is so perfect for fall! Speaking of my Etsy shop, did you notice it's been updated? Lots of finished quilts of all sizes, knitted and crocheted scarves, some aprons for all your fall and holiday baking, updated zippered accessory bag listing, as well as an updated listing of crocheted cotton washcloths. And of course some cozy afghans and awesome tote bags too! So lots going on here in all areas of life. If you don't hear from me for a while, it's not because I have nothing to share. It's most likely because I am spending what would be my blog time studying the reproductive system or the endocrine system or some other fascinating part of our human anatomy, or writing papers about different aspects of society for my sociology class! Have a great fall and I'll be back when the semester is over! Hi Mary Grace! Best of luck on your classes...we will miss your posts and look forward to see pics of all the wonderful items you are creating. Crocheted Hexagon Granny Afghan ~ Finished!